A couple of weeks ago I went to the Isle of Skye in Scotland for the launch of Talisker Port Ruighe, the latest release from Talisker and a new permanent addition to the Scotch malt whisky’s portfolio. The name, Port Ruighe, is a nod towards the Gaelic way of writing Portree, the location of the distillery on Skye, and the port casks that the whisky has been finished in. In essence, Talisker Port Ruighe is the Talisker 10 finished in casks that had previously contained port. In the company of journalists from UK, France, Germany, Italy and elsewhere in Europe, we tasted both the Talisker Port Ruighe and Talisker Storm (another recent release). While Talisker Storm is spicy, smoky and an obviously more potent version of Talisker 10, Talisker Port Ruighe was a softer, silkier and, for me, more elegant expression. The fruit is brought forward while the spice and peat is pulled back by the port cask finish which worked really rather well. It’s noticeably sweeter too but perhaps that doesn’t work so well for everyone. 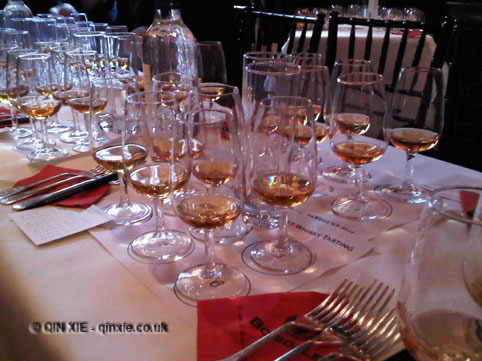 We tried two other approaches to the whiskies – tasting with food and an blending exercise. In the food session, we tried both Taliskers with food that picked out aspects of the whisky such as black pepper for the spice and strawberries for the fruit. While it highlighted what the blender, Maureen Robertson, had tried to achieve, it also helped to show how they might be paired to food, and desserts in particular. In the second session, which is sadly not available to the public, we tried our own hand at blending. We were given three liquids (whiskies at various stages of ageing) which we had to blend by taste and by smell to try and achieve a mystery liquid. Let’s just say it’s significantly harder than it sounds and it already sounds pretty impossible. The sessions and the trip itself was a great insight into how much of a skilled task blending whiskies is; it’s certainly hard not to be in awe by the end. Talisker had kindly hosted the trip to Skye. I was recently invited to sample some fine Scotch whiskies at 69 Colebrooke Row, where many a delightful cocktail had been consumed in the past. It’s the sort of bijou venue where there’s just enough light to cast a pleasing glow over everything, and everyone. And, if you know someone who knows someone, you can even take a tour in the lab upstairs where the possibilities are simply endless. The whisky was a flight of seven single malts from Diageo‘s ever expanding portfolio. The comparative tasting was led by Dr. Nick Morgan, Scotch Knowledge and Heritage Director at Diageo, with the aim of exploring the subtle nuances between different flavour profiles – from delicate to smoky, and light to rich. We started the tasting with the Glenkinchie 12 yo, the lightest and most delicate of the seven. Created at one of the few remaining Lowland distilleries, the Glenkinchie 12 yo is often served as an aperitif in France because of its lightness. It’s also quite malty and very easy to drink – a very good way to start off the flight. The second whisky, while still light, was decidedly more smoky – the Dalwhinnie 15 yo. In sharp contrast to the Glenkinchie, the Dalwhinnie was created in one of the highest distilleries in Scotland. It is the only distillery allowed to use water from Lochan an Doire Uaine, part of what goes into creating its uniquely clean taste. The next two, Cragganmore 12 yo and Oban 14 yo, were not too dissimilar. Both were fairly rich with fruity and honeyed notes. However, the Cragganmore 12 yo was perhaps a little more smoky with hints of sandalwood and cigars. The Oban 14 yo, on the other hand, had a distinctive brininess – a reflection of its seaside distillery location. Then we graduated on to a heavily smoky Talisker 10 yo. It’s almost overpowering until you mellow it out with a drop or two of water, which I know some will be horrified at but it really does help to bring out the flavours. In this whisky you would expect to find that rich sweetness of dried fruit as well as a slight pepperiness. The last two we sampled were both from Lagavulin, the 16 yo and the Distiller’s Edition. Created on the Isle of Islay from heavily peated barley and mineral water, both are smoky and complex due to the prolonged distillation process. The 16 yo was very rounded with a profile that reminded me of sweet smoked paprika. I imagine it would make a very good BBQ rub, that is, if you’re not too precious about using sipping whisky in cooking. The Distiller’s Edition, while still smoky, was a lot more mellow having been aged in Pedro Ximinez casks as well as the American Oak casks. That concludes the flight of whiskies but the evening doesn’t stop there. We also tried the Lagavulin 16 yo with a selection of blue cheeses – Gorgonzola Piccante, Roquefort and Valdeón; and the Distiller’s Edition with chocolates from Paul A Young – 64% Dominican Republic, Sea Salted Caramel truffle and Port and Stilton truffle. I must say I wasn’t a big fan of the blue cheeses but the chocolates, especially the Sea Salted Caramel, were absolutely divine. And as it was 69 Colebrooke Row, it wouldn’t be right to end the evening without a couple of cocktails. The Sterling Soda was the Lagavulin 16 yo shaken with lemon juice, barley water and vanilla cream soda then served in a tall Collins glass. The Lagavulin Liquorice Whisky Sour was the Lagavulin 16 yo shaken with lemon juice and liquorice syrup served in a coupette. Paul A Young has also created a special Lagavulin Liquorice Whisky Sour chocolate, with a gorgeous shimmery finish, to accompany the drink. And a very fine match it was too. That just leaves enough room for one last cocktail before my long journey home, a rhubarb and hibiscus Bellini that got me savouring for hours. I suppose that explains why I am always the last to leave – the savouring.